Refinement of the autonomous Takeoff & Landing algorithms. Autonomous, sustained hovers at pre-determined locations with position accuracy in all axes better than 0.5 meters. 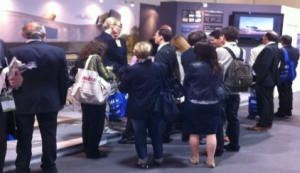 Successful performance of hover demonstrations for potential customers. In parallel, we are continuing efforts to obtain more funding to enable us to sustain and even expand our scope of work next year. We have been successful in obtaining part of this funding and this effort is ongoing in order to secure the remaining financing necessary to perform full mission demonstrations for our future customers. 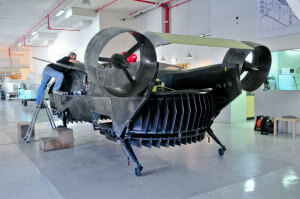 We have begun the airframe construction on a second prototype which will be equipped with the more powerful Turbomeca Arriel 2C2 engine (bringing this vehicle closer to our final production version configuration). This prototype will also be 60cm longer to increase the payload bay volume. 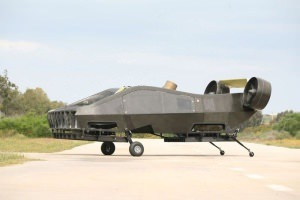 Having successfully completed the implementation of autonomous Takeoff & Landing algorithms, as well as high position accuracy in hover, we have now suspended flight testing until the beginning of 2012 to enable us to implement a number of upgrades. One of these is the shift to a fully redundant dual hydraulic rotor pitch control system. We expect to have the aircraft back in the air in February. We are back from the Paris Airshow after a very successful week where we had the opportunity to update a great number of people on our progress with the AirMule program. Our plans for the next few months are predominantly to continue our flight testing. 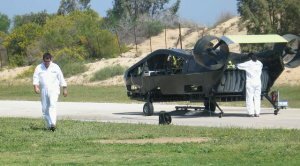 Below are some pictures from last week's event and also a picture of the AirMule prototype in one of its recent hover tests. Clicking on the AirMule picture links to a downloadable movie. 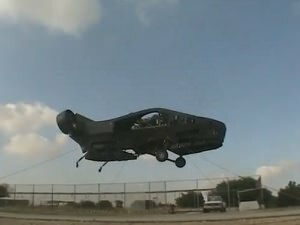 The movie shows an in-process test flight where the FCS (Flight Control System) is being adjusted for autonomous hovers, now for the first time with all six degrees of freedom (Pitch, Roll, Yaw, Altitude, X,Y Position) in "Attitude Hold" mode. In parallel, the FCS is presently being transitioned into fully autonomous takeoffs and landings. As can be seen, we are still testing with loose tethers attached. This enables us to carry out these hover tests close to home while still complying with civil aviation and insurance flight clearance requirements. Our plan is to release the tethers only once we decide to begin translational flight, probably later this year. 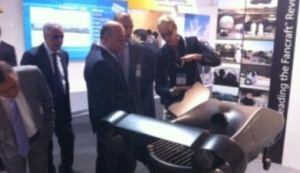 A new development that was displayed for the first time at Le Bourget is a planned variant of AirMule that will be equipped with remotely operated robotic arms. 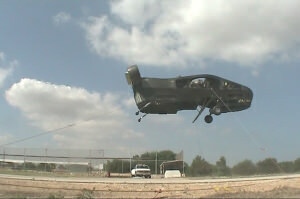 The trigger for this are recent approaches by operators of helicopters used for power line maintenance work, by agencies responsible for the safety of nuclear reactors and utility companies looking for inspection of very large structures, all asking whether AirMule could provide a solution for hovering for an extended period of time next to a structure that needs inspection or maintenance, and actually perform such operations using remotely controlled manipulator arms. Examples could include replacing damaged insulators on power lines, pumping heavy water into pools covering uranium rods inside damaged nuclear reactors, fixing leaking pipes or repairing areas under bridges or marine structures that have suffered corrosion damage. 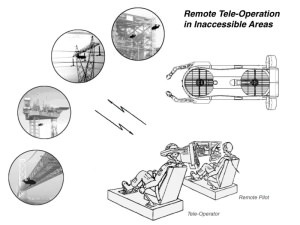 One way of performing such missions would be by using tele-operation as shown below. Our AirMule prototype has recently resumed its flight testing after a systems and structural upgrade that lasted 4 months. The vehicle is now flying with an expanded sensors suite and the new, energy absorbing wheeled landing gear. 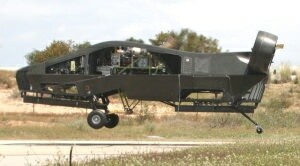 This landing gear has been tested and shown to accommodate the full spectrum of the FAA's FAR 27 landing requirements. In addition, aerodynamic improvements were made at the vehicle's lower fuselage for improving its control response in gusty wind conditions. Initial results from the tests look very promising. In parallel to the continued testing effort, we are now working to secure additional funding that will carry us through the next few years and up to full scale development and production. We will update you in our next update on the results from the present testing phase and/or once we have news regarding our multi-year program plans.